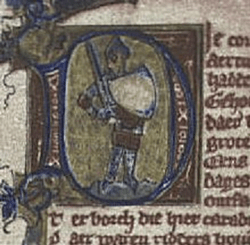 The thirteenth-century Roman de Fergus by Guillaume le Clerc uses its Scottish setting, described with a precision unusual for Arthurian romance, both to construct the identity of its hero, Fergus of Galloway, and to transform that identity, rendering Fergus less a son of Galloway in particular and more a representative of Scottish knighthood generally. But the romance’s geographical verisimilitude is not constant, and when the territory grows uncertain so does the hero’s sense of himself. Given his strong associations with native Scottish territory, customs, and peoples, Fergus emblematically stands as the prototypical Scottish knight among Arthur’s company; thus it is all the more consequential when his identity is nearly undone in an adventure to places not fixable within the map of Scotland. When his identity is reestablished under Arthur’s patronage, Fergus’s recovery comes with the political price of firmer subjection to Arthur as his feudal overlord. Scotland has occupied an equivocal place in the political geography of Arthurian literature at least since Geoffrey of Monmouth’s Historia regum Britanniae (ca. 1138), which describes Scotland as the site of some of Arthur’s most brutal conquests in the early establishment of his rule within Britain. In Sir Thomas Malory’s Morte Darthur (ca. 1470), the fellowship of the Round Table breaks apart along factional lines that pit knights allied with Lancelot and his French affinity against knights allied with Gawain and his Scottish kin. The Awntyrs off Arthure (ca. 1425), one of several Middle English verse romances set along the Scottish borders, shows unease with the encroachment of Arthur’s imperial ambitions, offering both a general warning about the human costs of Arthur’s expansionist policies and a specific dispute over the lands of a Scottish knight, Sir Galeron of Galloway.